Hi! We already covered the basics of shell scripting such as accepting inputs, process data through arithmetic operations and generating and displaying output in the previous parts of this tutorial (part 1 and part 2). In this part, we will go deeper to a more advanced topic in a programming language -- making decisions in a program, but this time we will do it using bash shell. Let's get started! Most of our programming languages today are able to make decisions based on conditions we set. A condition is an expression that evaluates to a Boolean value - true or false. Any programmer can make his program smart based on the decision and logic he puts into his program. The bash shell supports if and switch (case) decision statements. If is a statement that allows the programmer to make a decision in the program based on conditions he specified. If the condition is met, the program will execute certain lines of code otherwise, the program will execute other tasks the programmer specified. The following is the supported syntax of the if statement in the bash shell. The single bracket syntax is the oldest supported syntax in bash shell. It is used together with all conditional statements in Linux. Meanwhile, the double-parenthesis syntax is used for a number-based conditional statement to provide a familiar syntax to programmers. All types of if statements need a specified condition in order to execute a task. Conditional statements are used together with a decision control statement. There are different types of conditional statements that you can use in the bash shell, the most common ones are: file-based, string-based and arithmetic-based conditions. File-based conditions are unary expressions and often used to examine a status of a file. 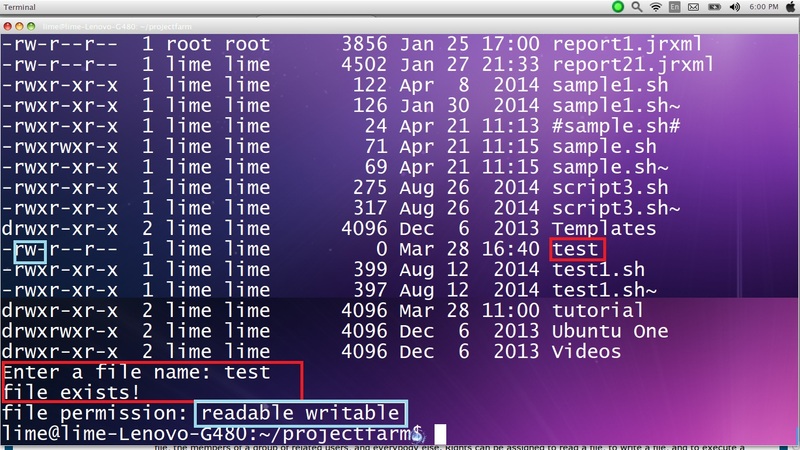 The following list shows the most commonly used file-based conditions in the bash shell. Let's have an example that will illustrate how to construct a file-based decision in a bash script. 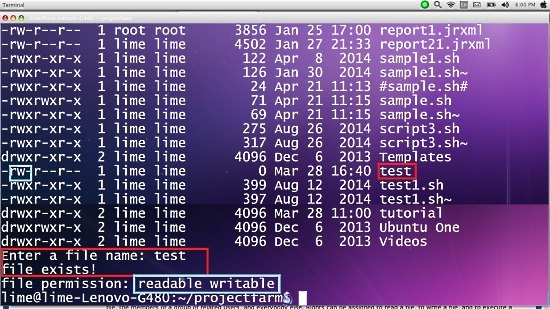 In this example, we will create a script that determines whether the file exists in the home directory. In this example, we ensured that the shell will return to home directory regardless of our current active directory using the cd command. 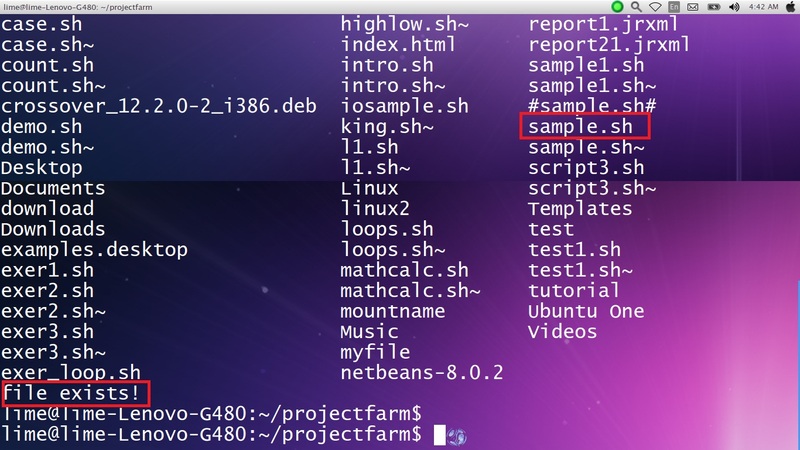 Additionally, the ls command is used to show the list of files in the directory for us to verify the file really exists or not. As you can see, the script outputs text "file exists!" because the sample.sh is in the home directory. Note: The shell compiler is very strict in terms of syntax especially with spaces. There should be a space between if and the open bracket and in between brackets and the condition. Now let's improve our script by making our code more dynamic by allowing user to input a script name and determine the permissions of the given file. Let's create a sample script using string-based conditional statement. The script will allow the user to input two strings and assess whether one of the strings is null, both string are equal and not equal. echo "The 1st string is null"
echo "The 2nd string is null"
echo "The strings are equal"
echo "The strings are not equal"
Let's create a script that accepts an integer from the user and determines whether the integer is a zero, negative, odd or an even number. The pattern is the possible value of the variable. Each pattern is separated with a double semi-colon which serves as a break statement of the pattern. The switch statement is closed with an esac statement. 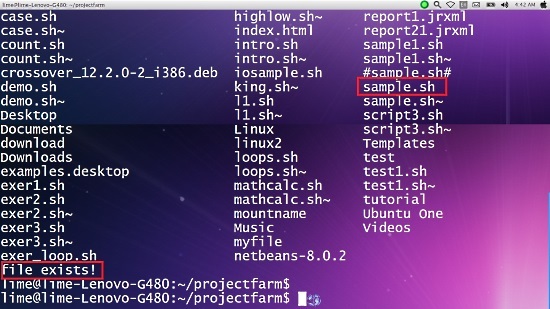 The bash shell provides many useful tools for programmers. Just like most of programming languages today, it is also capable of making conditional decisions that makes shell scripts more interactive and smart. We will feature repetitive control structure in the next series. 'Till next time. Great tutorial! Please keep them coming. Awesome! More of this, please!